A battery is an electrical device which is used to alter the chemical energy to electrical energy. Batteries are classified into different types based on the application, and these are used in several electrical as well as electronic devices. An electrical battery includes certain chemicals like compounds of mercury, lead etc and the lead of a battery is extremely dangerous in nature and are not environment-friendly. Apart from these, there is a chance for chemical leakage as well as the explosion of the battery in certain cases. To overcome this problem researchers have invented Bio-battery which reduced the impact of these chemicals and reduces the harm to the environment which gives a great advantage to humans. A Bio battery is an electrical energy storage device which is used in several applications. This battery can be powered with the help of organic compounds that are available in glucose form that is used in the human bodies. In the human body digestion procedure, as enzymes break-down the glucose electrons, as well as protons, are released. Thus by utilizing enzymes for break-down glucose, these batteries will get energy from glucose directly. Then these batteries will store the energy for the future purpose. This idea is approximately identical to how both plants and animals get energy. Even though these batteries still are being checked before being sold. There are many researchers as well as engineers are working for the future development of these batteries. The bio-battery construction can be done by using four components such as anode, cathode, electrolyte, and separator. All these four components are coated on each other so they stack up jointly. Similar to other batteries, in these batteries, the anode is negatively charged as well as the cathode is charged positively. The main difference between the anode & cathode permits the flow of electrons inside and away from them. In bio- battery construction, the anode terminal is placed at the top of the battery whereas the cathode terminal is placed at the bottom of the battery. In between these two terminals electrolyte is placed which includes a separator. Here, separator plays a key role by separating the anode and the cathode terminals from one another which can be lead to avoid the short circuit otherwise the entire battery will damage. In this system, the electricity will be generated by the flow of electrons as well as protons. Because the main energy source of Bio-battery is glucose so it requires plenty of glucose for generating the electricity. In the bio-battery, the breakdown of glucose can be done on the same rule while it is broken down into small pieces in the body of humans. 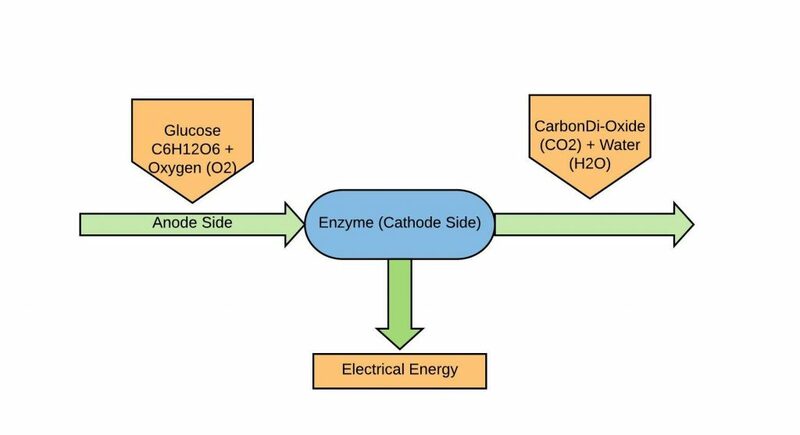 The working of the Bio battery is shown below the diagram. This system uses the flow of electrons as well as protons for generating electricity. The proton movement can be occurred due to the moving force which is known as current. The electrons flow can be from anode to cathode whereas current flow can be from cathode to anode. The bio-battery working operation is discussed below. The flow of protons can be travel to cathode side via a separator and the flow electrons can be travel to cathode side via a mediator. 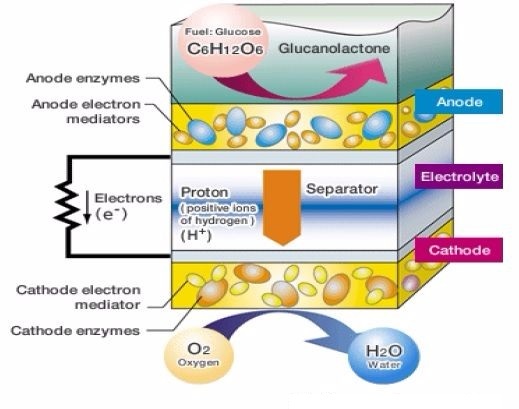 Enzymes are utilized at cathode side which generates water by both protons as well as electrons traveled from the anode side. Here, the reaction of Oxygen reduction is being used here. Above reactions will generate electrons as well as protons in the system. Finally, electric energy will be generated. Biobatteries are classified into several types like Enzymatic Bio-Battery, Microbial Bio-Battery, body fluid based bio-batteries, cellulose-based bio-batteries, etc. 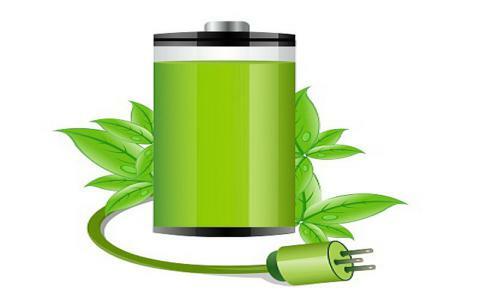 But Enzymatic Bio-Battery, Microbial Bio-Battery are the commonly used batteries. 1) Enzymatic Bio-Battery: In this type of battery, biochemical agents (Enzymes) are utilized for a breakdown of a substrate. 2) Microbial Bio-Battery: In this type of battery, Microorganisms such as Escherichia coli, electric bacteria, are utilized for a breakdown of a substrate. Biobatteries are much faster in charging the devices because of the quick action of the enzymes when we compared to other batteries. Bio-batteries don’t require external power supply due to the constant supply of glucose or sugar. Bio-batteries available by a high-energy density and it can be used easily at room temperature. Biobatteries are totally non-polluting, renewable, and also environmentally friendly. Biobatteries are very secure to use due to no leakage and explosions like chemical batteries. The bio batteries preserve less amount of energy as compared to lithium-based electrical batteries. The applications of Bio battery include the following. Bio-batteries are used in medical implants like pacemakers, insulin pumps, etc. It can be used as a charger for electronic devices like cell phones, tabs, power banks, etc. Bio-batteries are used in the defense field in the remote sensing devices, spying devices, as well as surveillance. Thus, this is all about Bio-battery construction, working, advantages & disadvantages of Bio battery and its applications. In recent days, the production of these batteries as well as research has been increased due to many features like environmentally friendly and they did not utilize metals or dangerous chemicals. Here is a question for you, how to make Bio-Battery? Wow, nice and comprehensive article. I’ve actually seen some group of people doing this in practice but on a small scale.